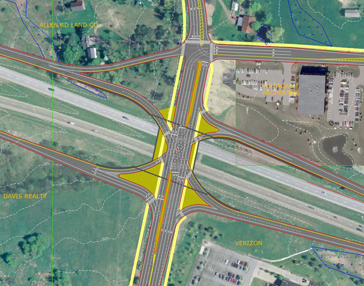 Interstate-89 Exit 12B Alignment Study | Resource Systems Group, Inc. Enhance access to the planned South Burlington City Center. RSG collaborated with local, regional, state, and federal officials to develop a series of future traffic scenarios based on the development potential of the surrounding land use with consideration for the provisions of the Metropolitan Transportation Plan. Using these scenarios, RSG utilized the county transportation planning model to develop the lane configuration required for a variety of interchange configurations, including a traditional diamond interchange and single point urban interchange (SPUI). The resulting alternatives were analyzed for traffic performance, cost, and environmental impact, with two viable alternatives proceeding forward with a financing study to identify funding for an Environmental Impact Statement.